With Fall officially here, I am actually on season for completing this runner. The background is from charm squares of Moda's Miss Jump's Scrapbag, which I was given during the 4SQS summer block swap. Normally I am not much of a brown person. In fact, I initially thought that these squares were just the thing that my mother-in-law would like, and was anticipating making a Christmas present from them. 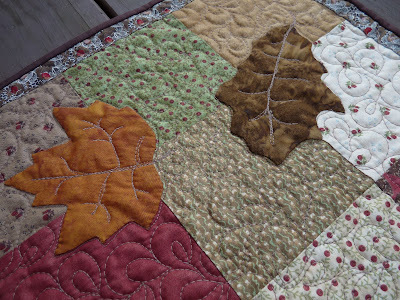 But the once I added the leaves in batiks, I really liked the runner. 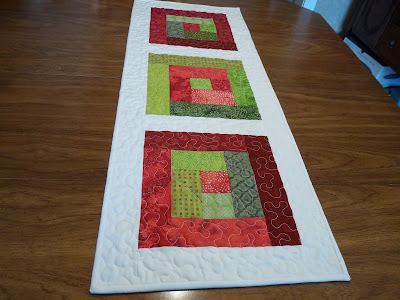 Thanks, Virginia - I even have enough of the squares left to make a smaller runner for my buffet (I just love to have 2 pieces that match or coordinate!!). 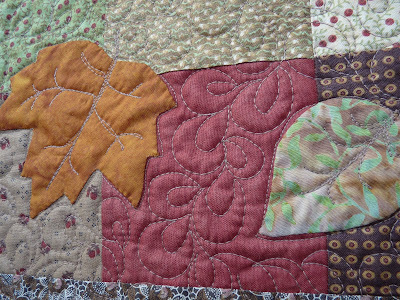 I almost did a fused applique, but in the end decided to needle turn the leaves. The oak and maples were a touch challenging with all of their points, but I think it produces a more finished look. This was my first attempt at a pseudo-peacock quilting. The first attemp got ripped out because I did not like the thread color (about 4 hours of picking!). This color is good on the front, but not my favorite on the back. I'll get over that because the back won't show! The 1" border is another fabric that I was given in the summer swap - I really don't like CW's at all, but again, this I do really like. And, it brings out the red in the runner too...almost appearing like little red berries. 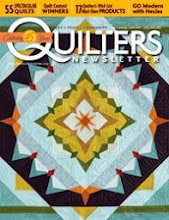 And in case you had not noticed yet, Amy at http://www.parkcitygirl.blogspot.com/ is once again hosting the bloggers quilt festival. Go check out her site. 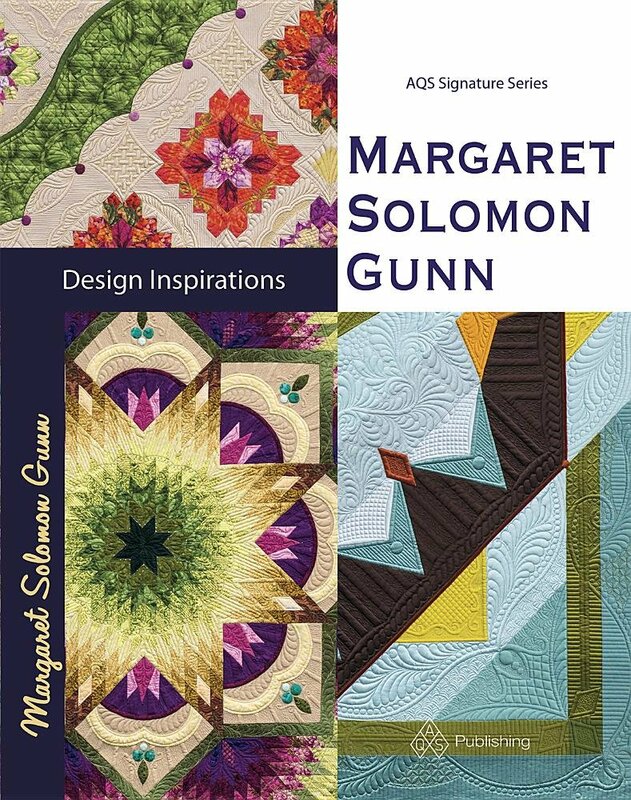 Last Spring there were lots of wonderful sponsors, prizes and quilts to peruse. I am also planning a giveaway for this event, so stay tuned! 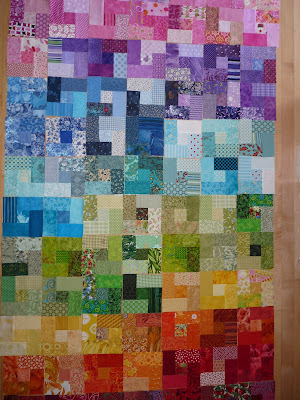 As I anxiously await the arrival of my long-arm, I am still making flimsies which I will quilt. This is one I started last month, a pattern from a magazine. I had to stop and reorder more of the Kaffe zig-zag after making a cutting error. Last weekend on my mucho-shopping spree, I picked up the deep purple that is on the border. It's about 60" square. This flimsy is a departure from the large-scale and modern prints I have been using a lot of lately. 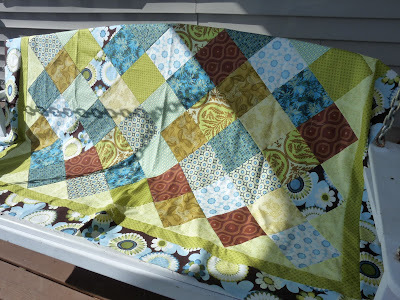 I had wanted to make some "beach" or picnic quilts back in the summer and had a hard time locating this Elizabeth Studios fabric which I really love. I did this 55"x65" quilt in rows. 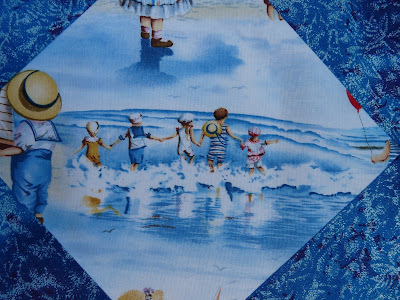 These beach scene "fussy cuts" are framed in a royal blue Fairy Frost which I managed to get 2 yards of for free back in the early summer (fabric shop kept sending me the wrong color!). I especially love the scene below - it reminds me of my mom's 5 grand children. 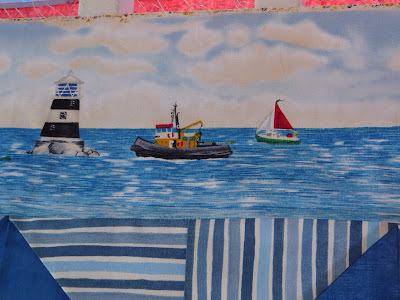 At the top of the quilt is a row of this sailing print (didn't show in the 1st picture I took). 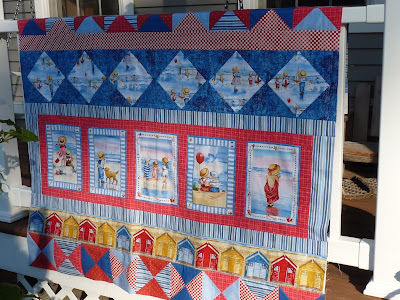 I think that living in Maine (and the scenes look very Maine-ish) may help this quilt to sell locally. 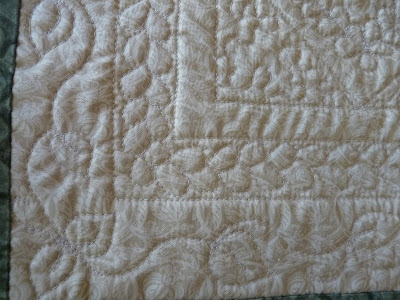 My last flimsy, which I have not decided yet if I will expand to a queen size bed quilt (now only 60" square) is based on the pattern done by Old Red Barn Co. It uses loads of modern large-scale prints, and exudes color and liveliness. It has many of the Chocolate Lollipop prints in it, as well as others. I know I will be swamped with things to quilt when I do get my machine, but that fact has not stopped me from making more. I have a twin bed flimsy in the works as well as a top from my 9-patch blocks, which is just for quilting practice. I realize I will need several of these before I start stitching away on one of the better tops I have made. 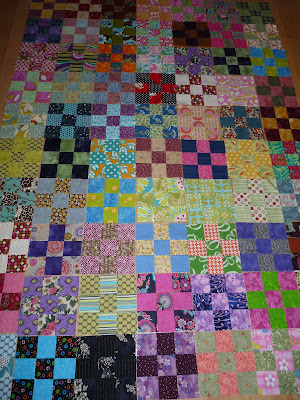 But before I get to that, a glimpse at what 53 quilts (and 5 flannel layette blankets) looks like. It took two shoppig carts piled taller than myself to get these into the store! As expected, the Project Linus event was quite the event - meeting many very appreciative and surprised coordinators. Honestly, I really don't know how I managed to meet my 52 blanket goal myself. I have agreed to help our new coordinator machine quilt a few of her tops free of charge. I figure that it will be good practice for learning the nuances of my new LA. Now, if that silly state tax ID number would ever get here so that they can ship it!?! 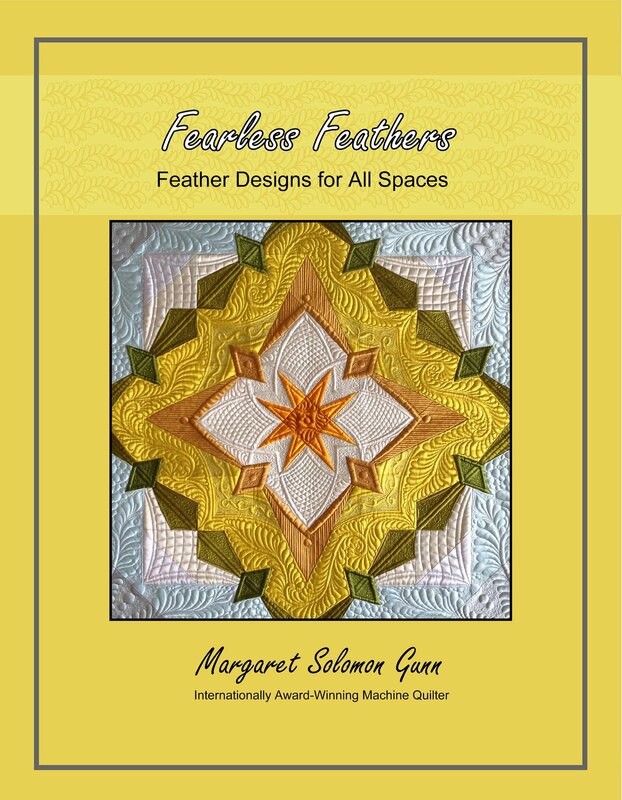 As mentioned previously, Mardens (the store hosting the PL Event), gives 3/4 yard for every quilt brought in. It used to be 3 fat quarters, but then when patrons started bringing in big numbers, that got impractical. 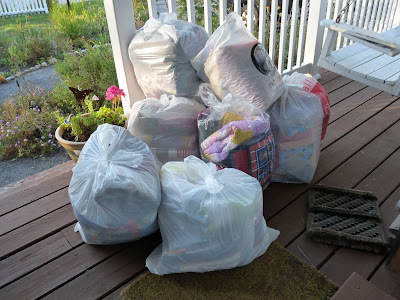 I left the store with 50 yards of material, 39.75 of which was FREE (and the rest was a mere $3 per yard!)! Earlier this week they got in a wonderful shipment of Carla Miller and Freespirit Anabella. My heart nearly skipped three beats when I saw all of the bolts. This pile hardly looks like 50 yards, but it is. Most are 1-2 yard pieces, but I did get 3 yards of at least 6 prints for using as backs. And (though not photographed, I got a few yards of wide Kona in white) - not so interesting to show. 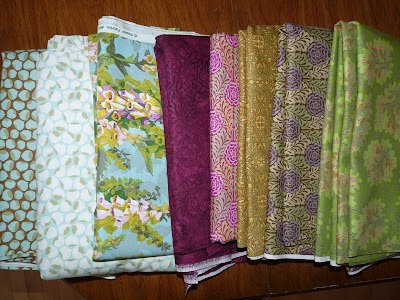 ...a lovely assortment in the green, aqua & brown colorway. ...And some very luscious kiwi and shades of red. These are SO gorgeous in person. ...And I have a couple of these, but a gal can (should) always have more. 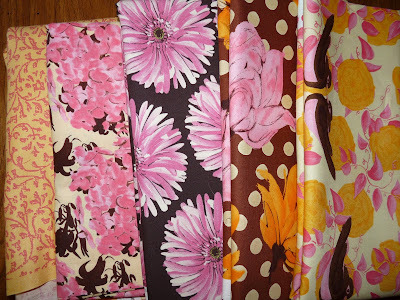 ...and a few yards of rogue prints that did not coordinate much with others i got, but I still liked them. First off, with bated (sp??) breath, I can happily announce that I have made a decision. The rambling thoughts of "which long arm should I get" are thoughts of the past. I spent one last week, contemplating and investigating one last possibility. The rep from APQS was waiting anxiously to hear from me. She'd even gotten me a base extender (a $100 deal) added for free. Still I was not certain. That machine was over $15000 with the incentives of the Road Show, and to me that was a heck of a lot of money. OK, a helluva lot of money! The one thing I kept coming back to was a desire to have a rep closer than 2 hours away, should I need assistance, purchase parts, etc. On Tuesday I spent time on the HQ Fusion, which for some reason I never really considered all that seriously. It was more pricey, and that was probably the main reason. But after trying the Millinium and the HQ16 both, I knew that the Fusion was it. This machine is a big step up over the HQ16, and it sews like a warm knife through butter. Circles are round (as we'd want! ), and this machine has 20" of space to sew. I absolutely loved it. It's a little more than I thought I'd spend, but over $3K less than the Millinium, which I had yet to really enjoy using. This afternoon, I officially ordered the Fusion!! My other accomplishment is finishing my last and 52nd quilt for my Project Linus donated quilts. 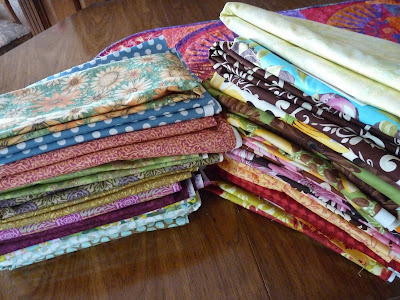 I am taking all 52 tomorrow to a local event, where 3/4 yard of fabric is given for every quilt donated! Count them...39 yards of free and wonderful fabric!!! The event is a total ZOO, but I love it. I learned that my region now has a new coordinator, so we should be having events again. The blocks for this quilt came from the flickr Quilt Block Exchange. I was going to machine quilt this on someone's Millinium three days ago, but after testing the Fusion, I knew I didn't need to. Instead, I used my home machine and finished it up yesterday. I love the modern look of the pink & orange. Way cool & sweet! 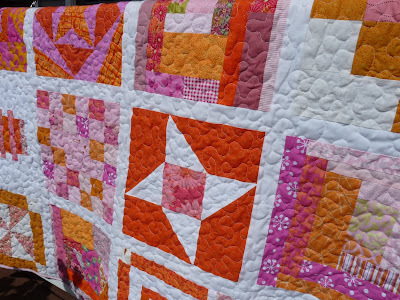 There are seven quilts in my donation that have come from blocks donated by swappers that did my Spring Fling Round Robin. These quilts all came out so fantastic. 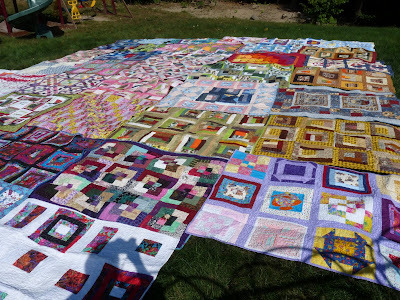 I have two quilts which Kate sent blocks for. 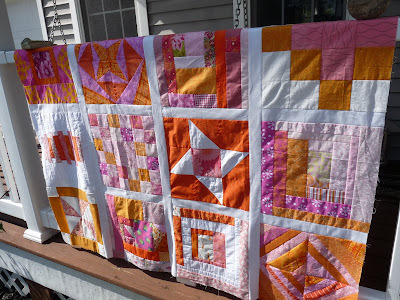 She has one heck of a block stash from her various swaps and Block Lotto winnings. It was tremendously generous, and children in my area will definitely benefit. So, if you find that you have blocks in your stash that you don't know if you'll use or when, I'd love to offer to give them a good home. 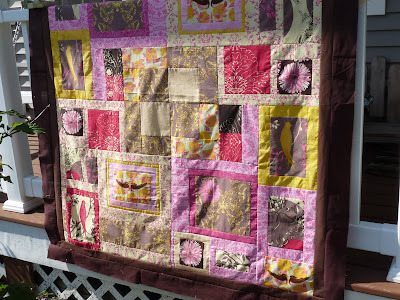 I love scrappy quilts, and love to make scrappy quilts! Here's a few more pictures in a flickr slideshow. What next...Finish cleaning my basement out. I started that today, but it's got a ways to go. The LA should arrive in 1-2 weeks. Other things...finish off row for row robin, add on to a round robin, and continue with my business-y. Oh, and the absolute worst thing...I must start on Halloween costumes - my all time least favorite thing to sew! 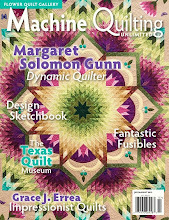 ...and by "do something", I mean more quilty related than just talking about the ultimate purchase of my quilty life. So here are a few peeks a two holiday table runners I have made recently. I am making several large quilt tops as well, but I wanted to get a few smaller items made up that I could actually quilt right now. I made one like this for myself last year. The quilting is a bit different, but basically the same concept. 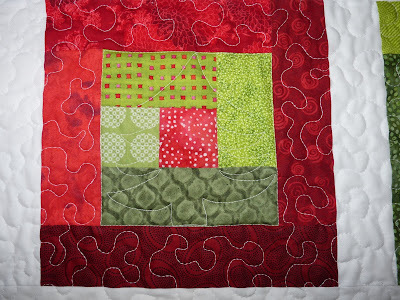 It is fairly retro red & green prints in a bold block-log cabin pattern. The quilting is stippled, except inside of the center squares, where I did a modern-ish looking Christmas tree. This runner is 14"x38". 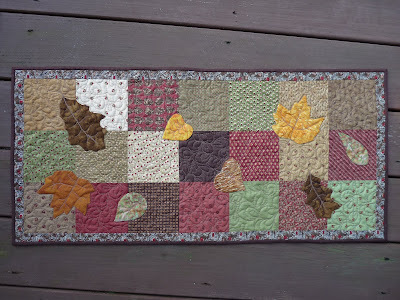 The second table runner is more complicated, in that it has more detailed (though not really very hard) piecing, some hand, needle-turned applique and more custom quilting. It is about 16"x38" or so. There are three little presents on the runner, hand appliqued. The fabric I selected is absolutely perfect for simulating a foil present wrap in that is shimmers. It is a 100% cotton though. 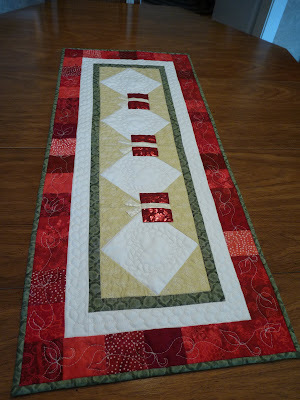 The quilting on this runner is similar to one I made earlier in the spring for my son's teacher. I did feathered hearts and a feathered inner border in a beige thread so it subtly showed against the white Kona cotton. Really lovely, I think. The back has a beige print, so the thread blends in. 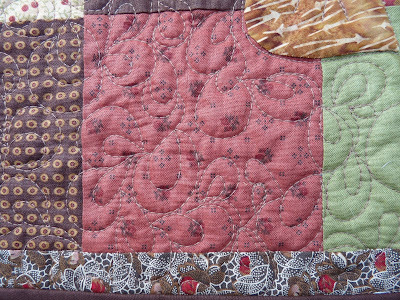 When held in the light, here's a peek at the quilting. I am slowly getting organized, getting an Etsy shop establishd, and preparing for when that LA arrives in October. Look for these two table runners there, and more! And it's cutting into my quality sewing time too! Tomorrow I'm going to lose an entire afternoon of not having my 5 yr old home (this is PRIME sewing time!!). That is the long arm shopping event in my life right now. I have been amazed at the responses from the HQ and APQS reps, as well as others who have machines. I have managed to get the Road Show special deal window extended through this week so that I can visit someone that has a Millinium set up in their home. Amazing that at the shows, they don't really tell you that the home set up may be a lot different than on the narrow show machine frame, which is dreadfully stiff. My thanks to Dawn-Marie for inviting me to quilt a Linus quilt on her machine (now I just need to get to Joann's between tomorrows appts to get backing and batting). My local Maine rep has also managed to sweeten the deal a little by adding in a base-extender, which I would have ordered right off. Still, the $15400 price tag is hard to swallow. Can I earn this back with customer quilts?? How long will it take me? Is this really what I should be doing?? OMG - the decisions! Concurrantly, I have been serenaded (for lack of better words) by an HQ rep. She's given me great information, which is nice. I have also been in touch with the local HQ rep, who I am meeting with tomorrow. They have a free shipping deal this month. For some reason, I have been focusing on the HQ16, and had almost forgotten the Fusion. This machine is a much better comparison with the Millinium, having a mostly comparable throat/quilting area. It's less expensive and has a less desireable warranty. I did test it at the Maine Quilt show, and liked it fine, but 2 months ago the $12ooo price tag made me shudder. It's smaller and less expensice sister, HQ16, managed to get more attention from me. Today, the Fusion doesn't look so bad! I would not feel compelled to finance a third of that like I'd likely do with the Millinium. I am anxious to take advantage of "spur of the moment" Nana day care tomorrow afternoon so I can whisk off to try it out. Oh, the joys of retirement! I so appreciate all of the comments which have been left, even those from the sales persons. I know that you are biased towards your machine, but the information has been exactly what I was looking for. I had hoped to hear more from actual users to see what led them to select the machine they chose, and why they love it as well. A little background...I am not approaching this naively. I have tested all of the major manufacturers for which there is a sales rep near me. Perhaps if I lived closer to a large metropolitan area, this might be simpler, but where I live does limit the choices. 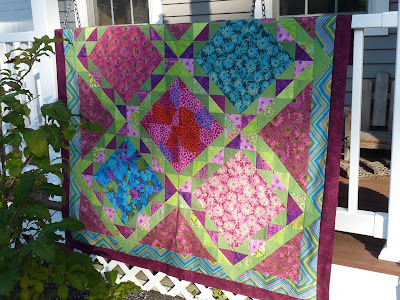 I tested four machines at the Maine Quilt Show in July, three of which I'd truly consider. The one I liked the best (Gammill) has a rep either 2 states (4-5 hours away) or instate and nearly 3 hours away. I do believe that these are highly reliable and sourcing your rep is not an everyday occurrance, but I also know that I want it available should it be needed, whether this is for a problem or to take a class. I took a 2 hour class on the HQ16, and then spent 2 hours quilting 2 quilts on my own. I was able to get a good feel for the machine's vibration, tendency to break thread, use of groovy boards, stitch regulator, etc. 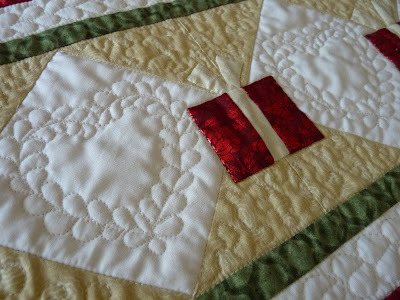 It was mostly smooth, and I could visualize the "kinks" inmy quilting disappearing in a short period of use. 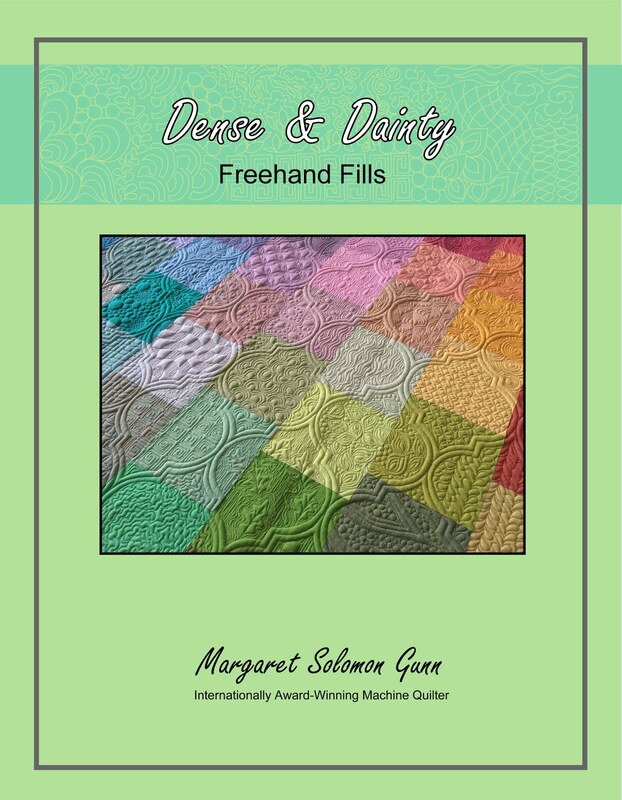 This machine made the transition from free motion quilting on a home machine to a LA seem natural. I cannot say the same for the APQS. Now, I took the same aproach for these machines as well. They were tested at the show too, and were my least favorite ones. It had a stiff, jerkier feeling. I could not make smooth curves, just "rounded" off squares. But everyone I heard from said they loved this machine, and that it comes with practice. Again, it didn't have a rep within an hour of me like the HQ, so it was not a high contender. Yesterday I went to the Road Show, with a very open mind, hoping to come away with a great bargain of a machine. And it was a good deal - $2000 off the Millinium, free motorized rollers and free quilt glide. But even after 45 minutes of playing and testing, I still hated how it quilted. I am not interested in a LA that takes me 6 months of practising before I am qualified to make something for someone else. I cannot afford that from the perspective of paying for the machine or the scrap fabric. I also ruled out the Lenni yesterday, as it has the same stiffness and jerkiness, and has no channel locks whatsoever. I am struggling over this purchase more so than I would if I were buying a car three times the cost. It's very personal to me, and I know there's likely no "swapping" it or "trading up" three years from now. It's still a shock that my husband said yes to the thing in the first place. So, what do I say to all of you faithful Millinium users, Love what you have. I personally do not share that feeling from my experience, but it is your decision, and this is mine. I feel as though I have done my homework and am not making an uninformed choice. If you have or use an APQS long arm machine...I'd love to hear from you. I am going to a seminar today hosted by APQS, with the hopes of being able to select which LA I will purchase afterwards. It is down to the HQ16 or one of the APQS's (may depend too on any road show discounts). Things I am interested in...reliability, ease of use and learning curve, how frequently and where must machine be oiled, how often do you service the machine (my dealer is NOT close), and your personal thoughts that the agents today might not give. I guess it's about time to face the music...Summer's a coming to a close soon. It's pretty warm today, but with school back in session and me back at work teaching, the long and lazy days of summer are ending. It's time to move onto new ventures and make new plans - plans to carry me through the winter. 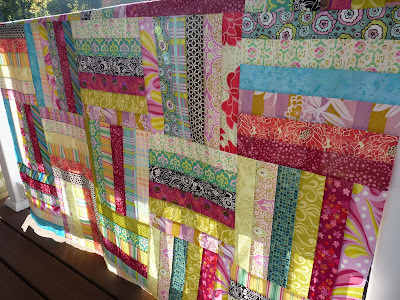 A couple weeks ago I showed the blocks I made for the flickr Quilt Block Exchange. Here are the ones that I received. One's not shown because it is the wrong size. And I actually made two of these so as to have 12. Sadly, I have run out of batting and am holding off buying more right now, so this (what would be my 52nd Linus quilt for this year AND the last of my goal for 2009!! ), will have to wait to be finished. 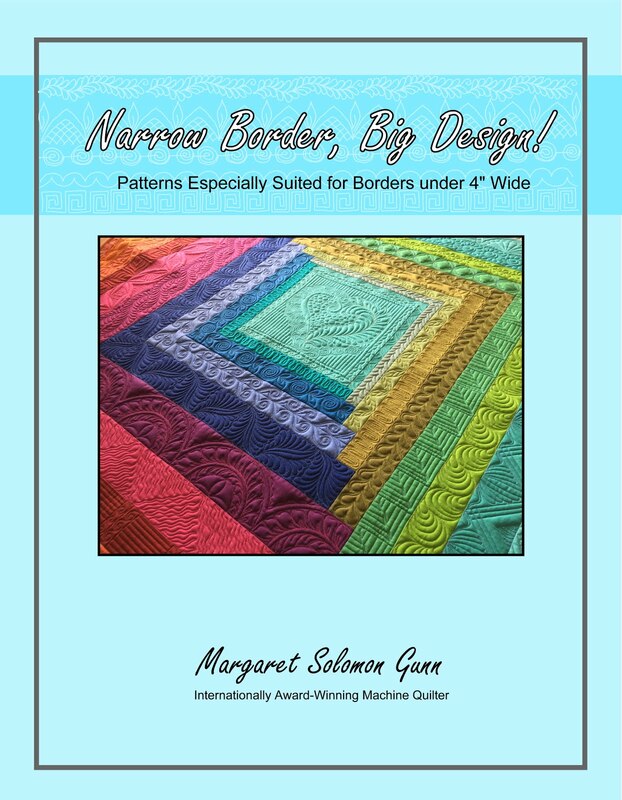 I have an offer from Dawn-Marie to use her Millinium Long Arm, and I think that this is the quilt I will play with on it. Surprisingly, she signed up for the 4SQS Holiday swap, and lives at most 5 miles from me! 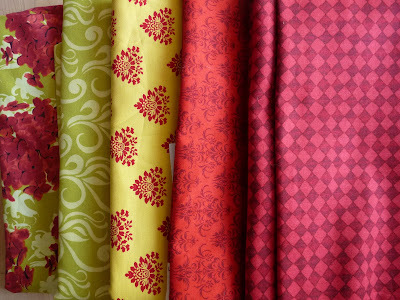 It is fun to see the assortment of colors, fabrics and patterns that come when all you specify is "pink and orange" blocks! I have made this row for the Row Robin swap I am doing. 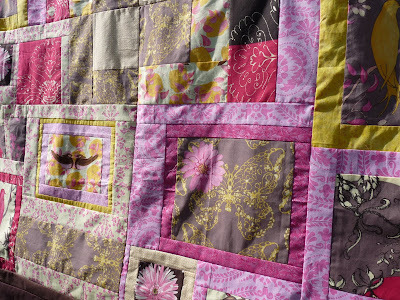 The owner of the quilt has specified "In the forest, at night" as her theme. I have found this to be limitting. Perhaps it is just my lack of design mojo right now. The other four rows that have been done are here. I couldn't think of an animal that is out at night, given that the owl was already done. I hope that Harley thinks it is OK - I just aimed for a variety of trees with semi-dark backgrounds. I am going next weekend to an APQS seminar for 3 hours to learn about their long arm machines, aspects of a LA business, etc. They also said we'd be able to play on some machines. I do not know yet about any trade show "discounts", but hopefully I will be prepared at that point to make a purchasing decision. The APQS was my least favorite LA that I played on at the Maine Quilt show in July, but I have heard from enough others that have them and like them. I thought it was worth another look. I have not named them, although this reminds me of the beach surf and driftwood because of it's colors. It mostly from the Marcus Alfresco line, which is really pretty. 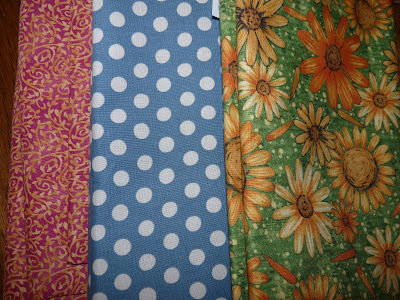 Best of all, I bought the fabrics from Whittles for under $4 per yard too! It measures about 55"x60". I didn't buy many of the fabrics for this flimsy (#2) recently - earlier this spring I think - so they were mostly full price or $7-9 per yard. I have mixed the Freespirit Annabella and Treetop Fancy lines. Both sets of fabrics are outta this world, if you asked me!! There are also touches of two tones of pink Fairy Frosts in the framing. These fabrics were more challenging to work with because I found myself fussy cutting much of it, but not wanting to waste the remainder. This flimsy is 53"x61". And lastly, I have a 4th flimsy in the works. 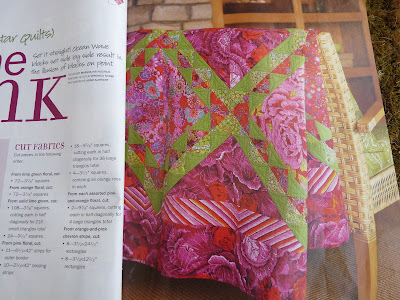 It is based on this pattern below that I saw in a quilting magazine. 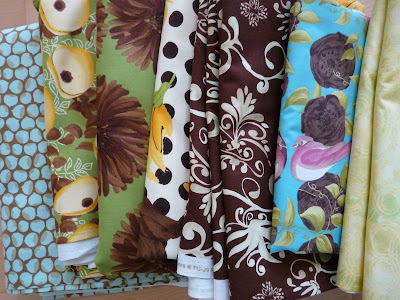 I coincidentally had many of the fabrics, and even the chevron border fabric. The center of the quilt is done, but this morning I was assembling the border and made a critical mistake. Sadly, I had to order more chevron fabric before I can finish it :-(( It is really pretty, though, all done in Carla Miller and Kaffe Fasset prints. Maybe next week I can show this! Here are about 70 blocks I now have from a 9-patch swap hosted here. These are all 6.5" square blocks, or sort of. I have been kind of pokey about doing/starting anything with them. What you don't see, is the other pile of these blocks that are anywhere between 6" square and somewhere under 6.25" square. There are 18 mis-sized blocks out of a swap where only 48 were sent!!! And this is AFTER I took many of them apart and tried to fix them too. Apparently they were cut incorrectly and are unsalvageable. 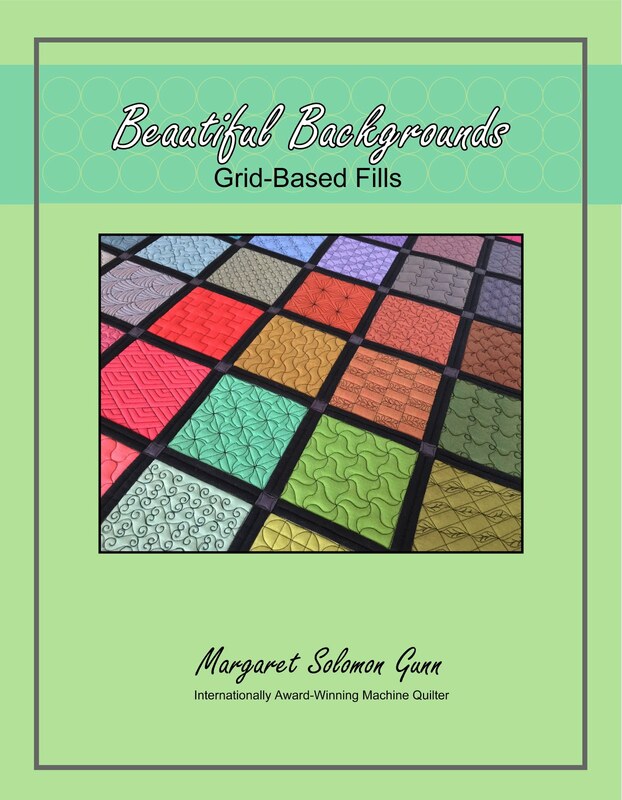 I will however try to connect them and use them on a quilt backing. Oh, and a great thank you to Vanessa, who sent me her 32 blocks (with about 10-12 bad ones of course - which do factor into that 18 erroneous blocks) after the first two of three rounds of this swap. She, too, got tired of the complete lack of quality controls and sent me the blocks last month. I hate that the hostess said she'd send back undersized blocks and in the end, did absolutely nothing. It goes against everything that I believe in, sadly. It bothers me to send blocks back to people, but it bothers me more to send along blocks that are most evidently unacceptable. Here's another set of blocks. These are from my Colorblocks swap. OK, the swap made only 40 blocks (a few people did 60) - I. personally, made a ton (ok, about 100) of blocks! They are fun, colorful and very nearly all 6-1/2" square. Who would have thought that they could mostly all be sent the correct size??? ...snicker of sarcasm. 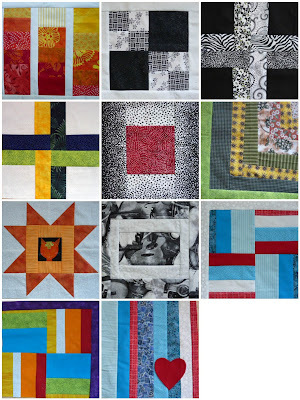 I have not really decided what I am doing with any of these blocks, but they will likely all become donation quilts when I procure more batting. It's 11th hour now, but if you are interested in joing a monthly block swap, check this one out on flickr. I will post August blocks I received there later this week.